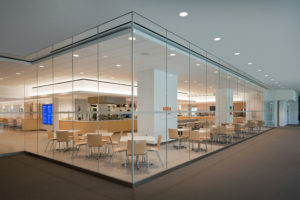 Working with outside consultants Perspectus Architecture (Cleveland), Cleveland Clinic gutted two separate food service locations on the second floor of its Crile Building in Cleveland to create a single dining location for staff, patients, and families. The glass-wrapped dining space boasts an expansive curtain wall along three sides, flooding the area with natural light and views. The kitchens are organized into “food neighborhoods,” each providing a different menu option. A minimalist palette of materials, including gray and white walls, maple wood accents, and stainless steel appliances, reinforce a sense of calm, while signage is kept to a minimum to avoid visual confusion. 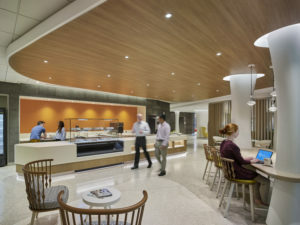 Baylor Scott & White – The Heart Hospital Plano’s new North Tower expansion in Plano, Texas, provided the opportunity to replace an existing dining facility, which was tucked away in a remote location, with a more accessible and inviting restaurant-style café. Designed by E4H Environments for Health Architecture (E4H; Dallas and Fort Worth, Texas), the new Heart Rock Café is located on the first floor between the lobby, cardiac rehabilitation gym, and auditorium. 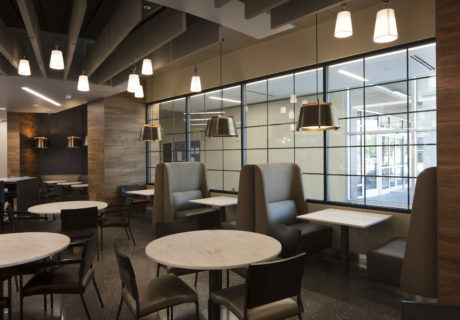 The servery features presentation-style cooking, while the dining room offers a variety of seating options, including high-top communal tables and booth seating along windows that overlook the corridor and an outdoor area. A hospitality aesthetic guided the materials selection, including honey-colored woods, terrazzo flooring in a deep gray taupe, and decorative pendant lighting.